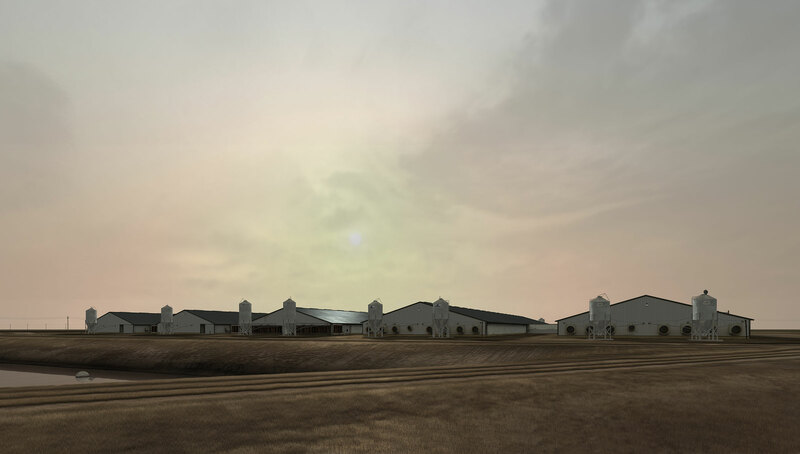 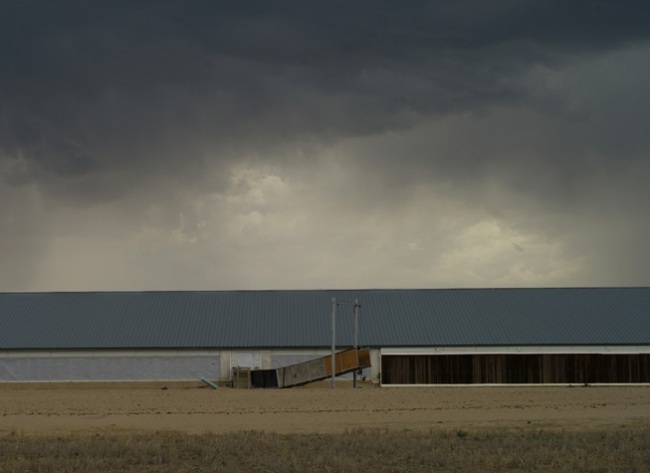 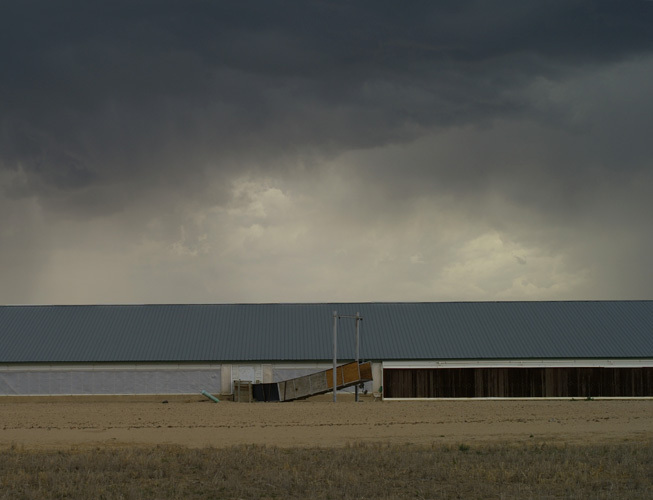 Sow Farm (near Libbey, Oklahoma) 2009 depicts an existing agricultural complex on the American Great Plains. 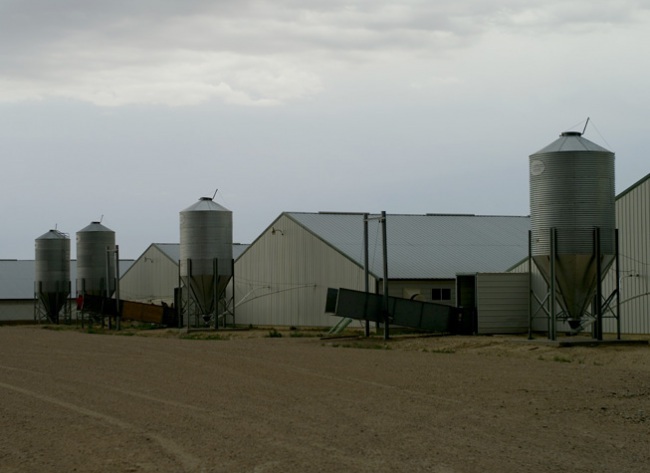 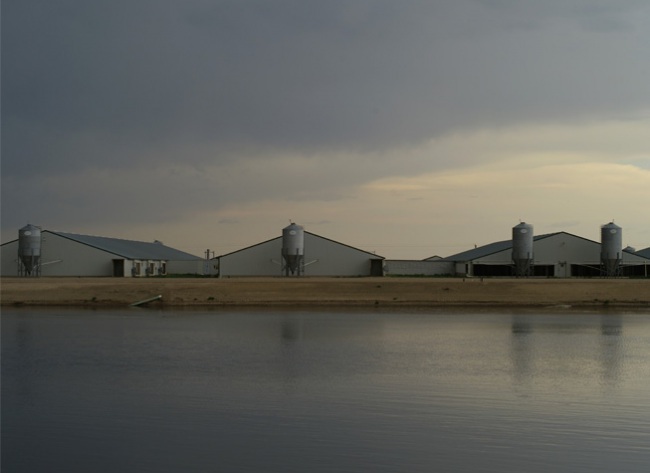 Each of the corrugated iron sheds houses a large but unseen community of sows engaged in mass farrowing. 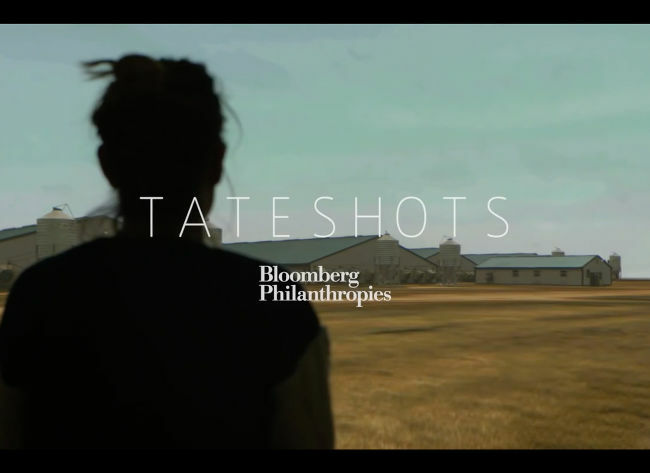 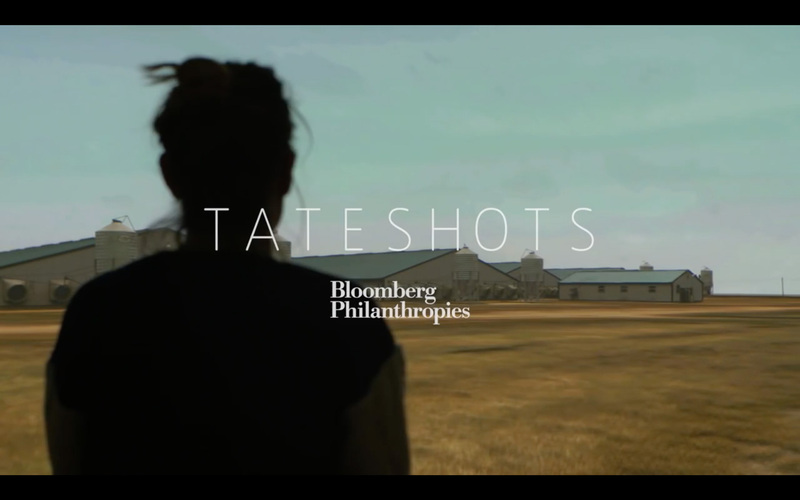 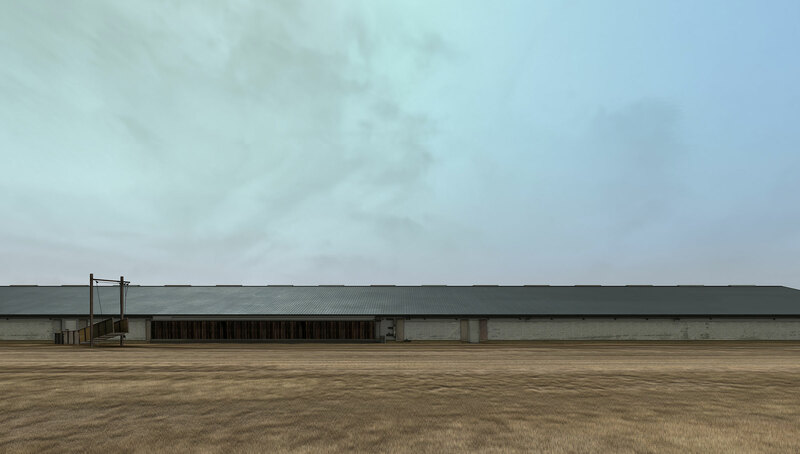 Set low against the plains, the structures have the cold, institutional feel of a military or correctional facility. 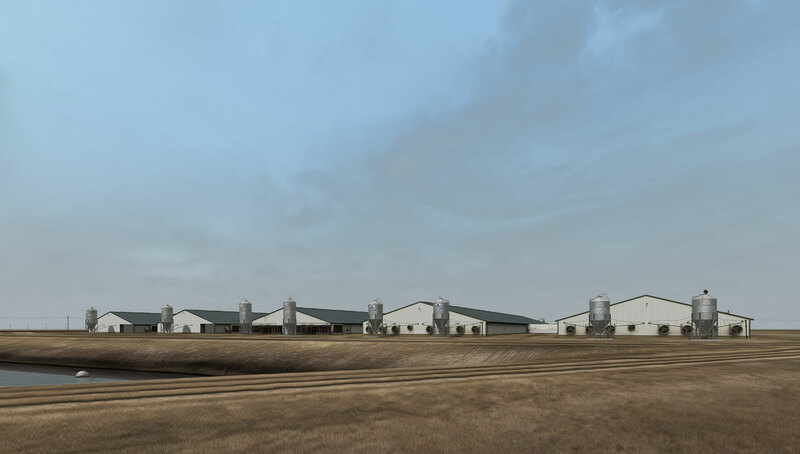 In a symbolic moment of exchange within the work, reflecting the growth cycle of the pigs enclosed there, a single transport truck pulls to each building every 156 days and waits for one hour. Behind the sheds lie large effluent lakes. 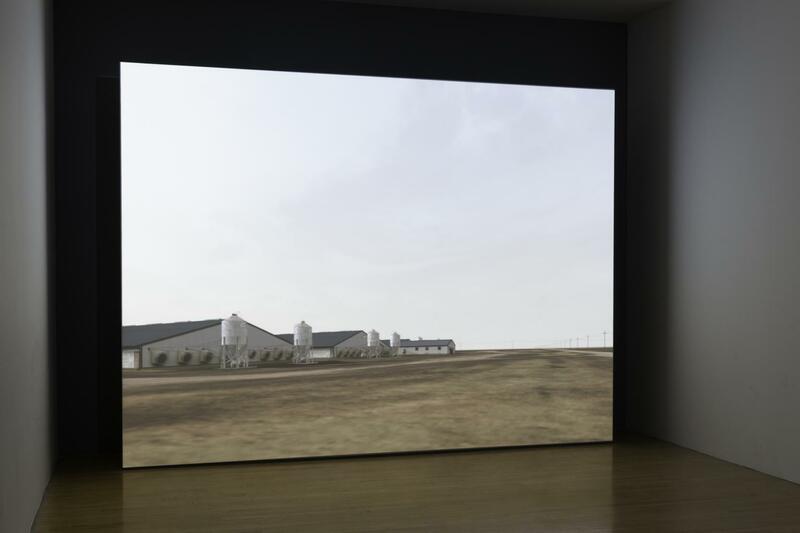 The artist uses photographic documentation gathered during site visits to create virtual portraits in which an orbital camera presents a 360-degree view of the landscape set within an unfolding 24 hour day, and 365 day year. 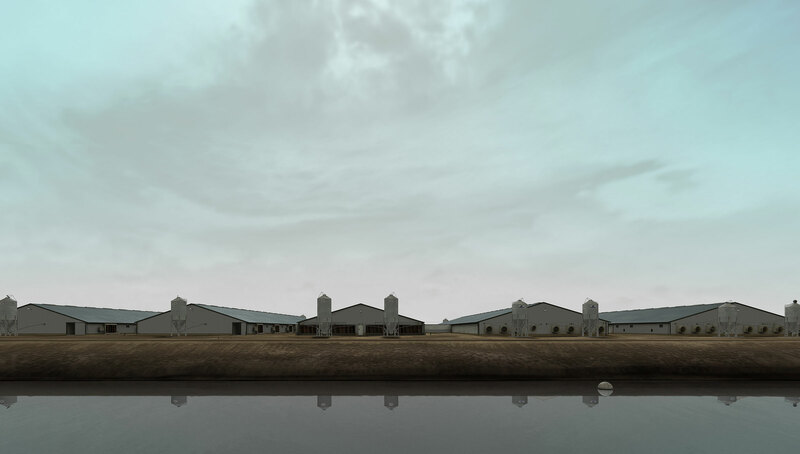 The work was subsequently constructed over a period of a year using 3D modelling and Realtime 3D, a format more commonly associated with the gaming industry. 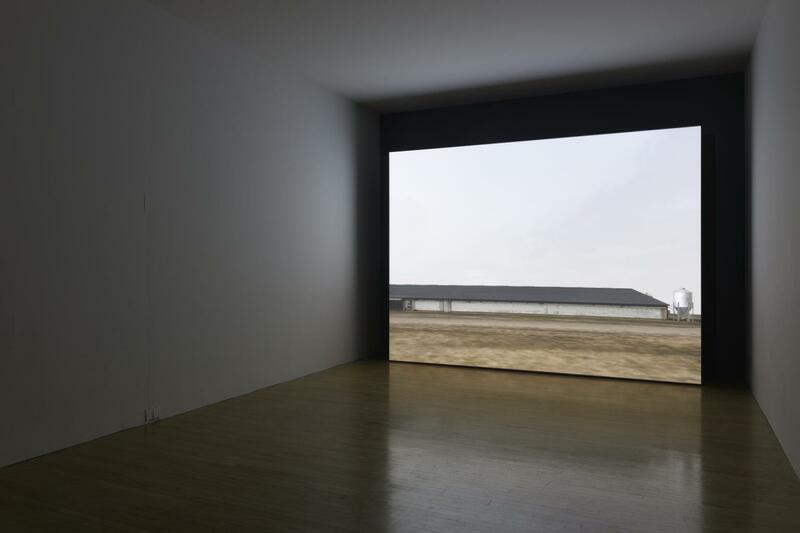 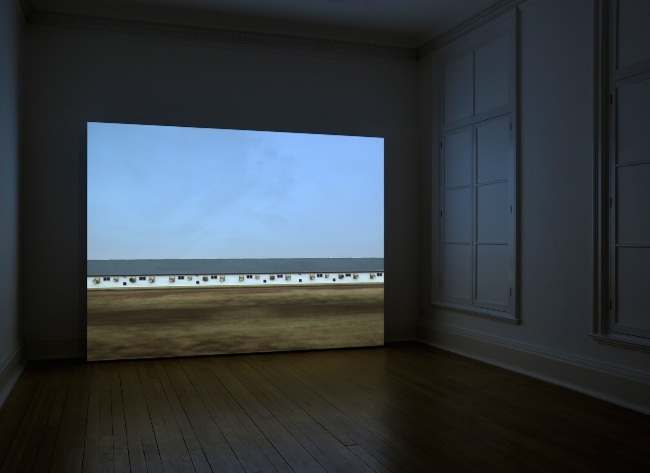 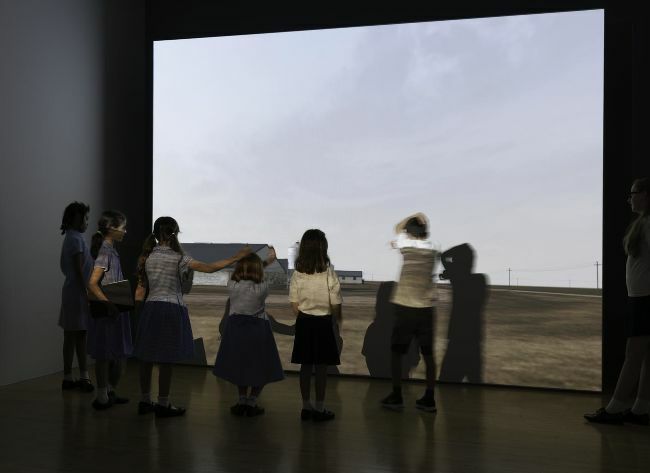 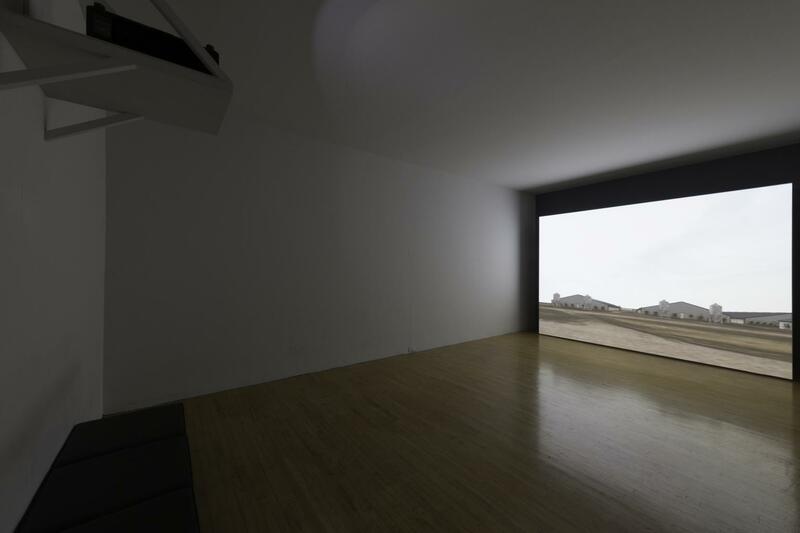 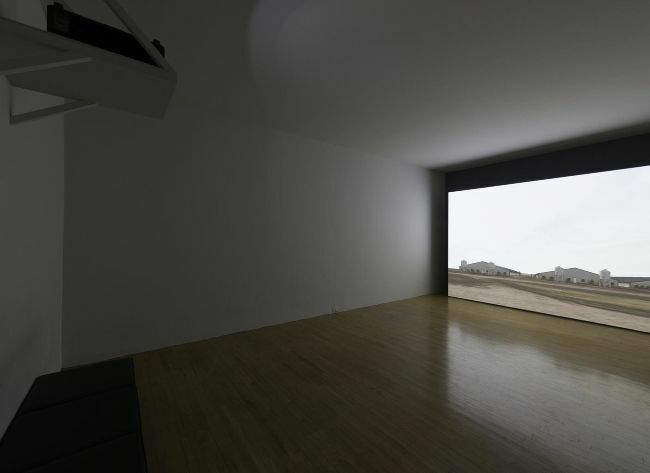 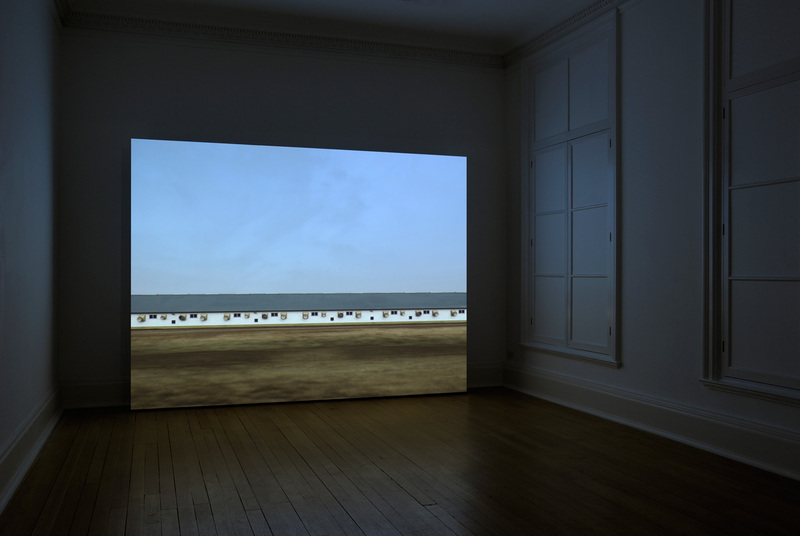 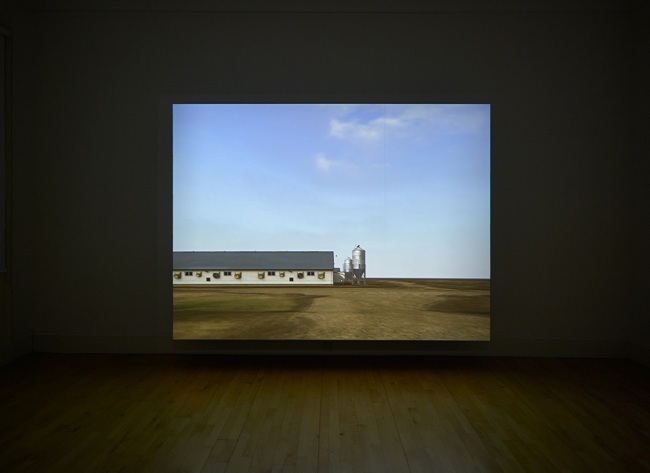 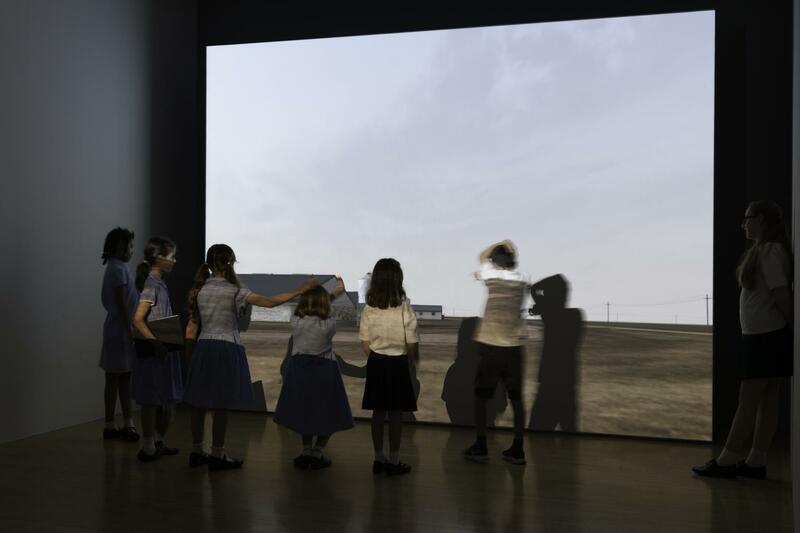 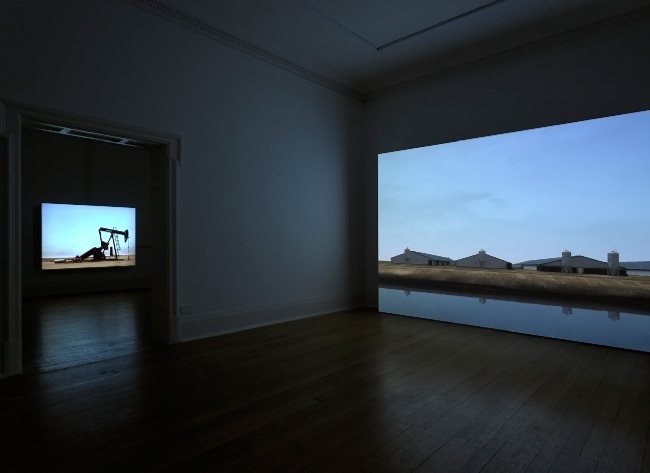 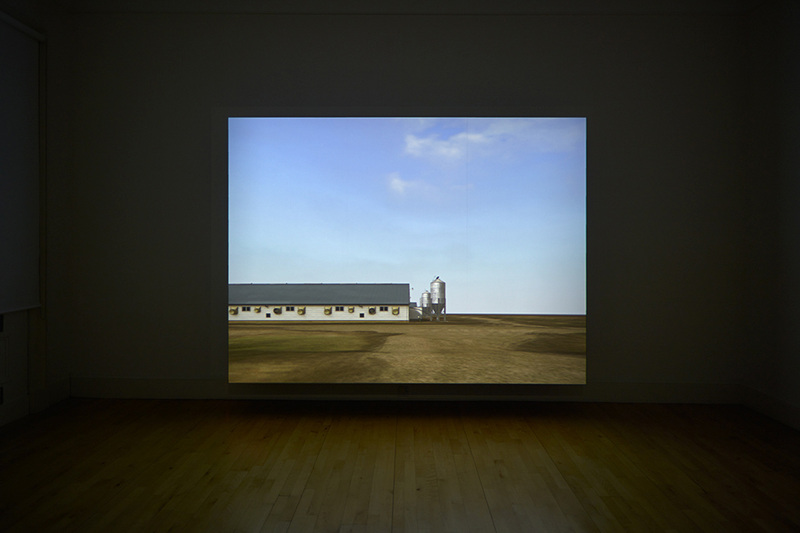 As part of a walkthrough the permanent collection, Sow Farm (near Libbey, Oklahoma) 2009 has been installed at Tate Britain as a projection. 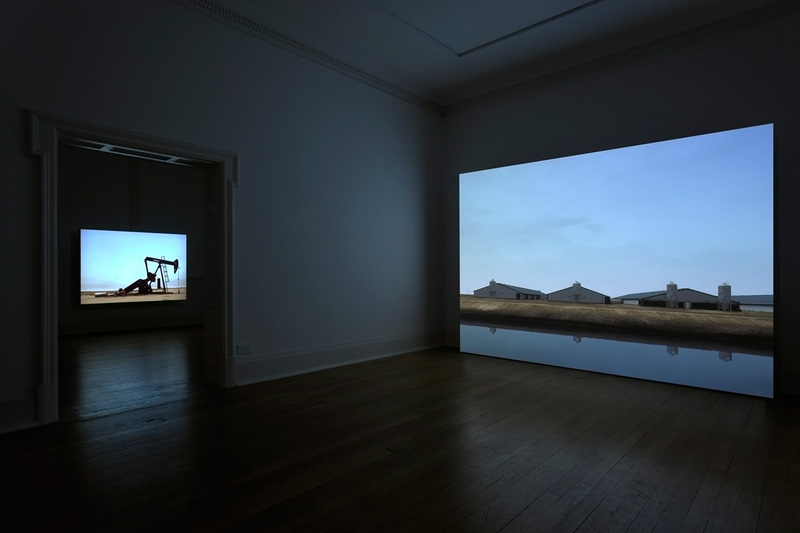 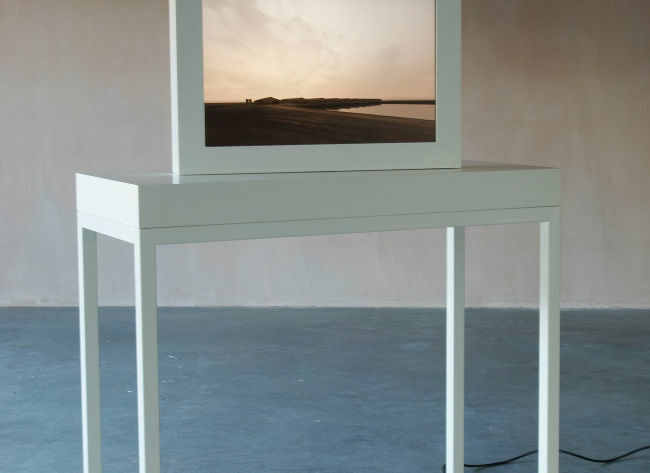 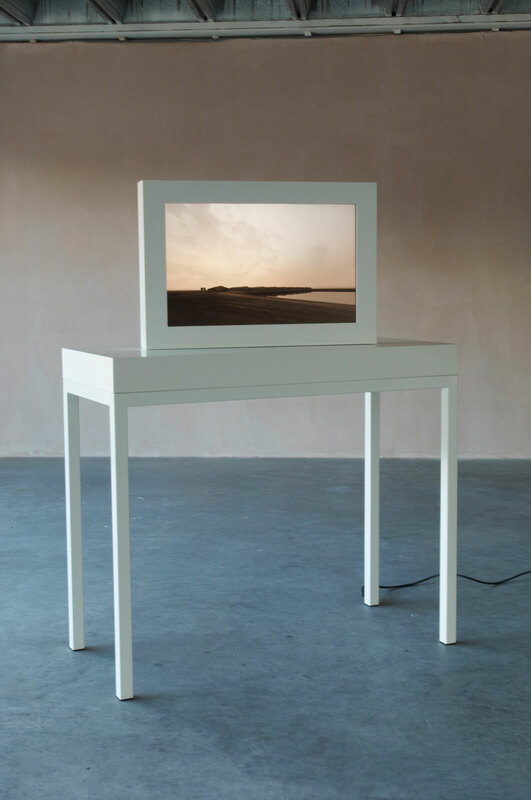 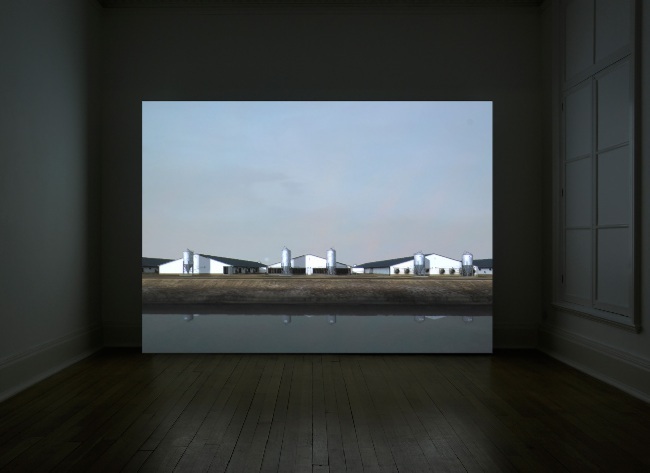 Thomas Dane Gallery is pleased to announce the first London exhibition of Irish artist John Gerrard. 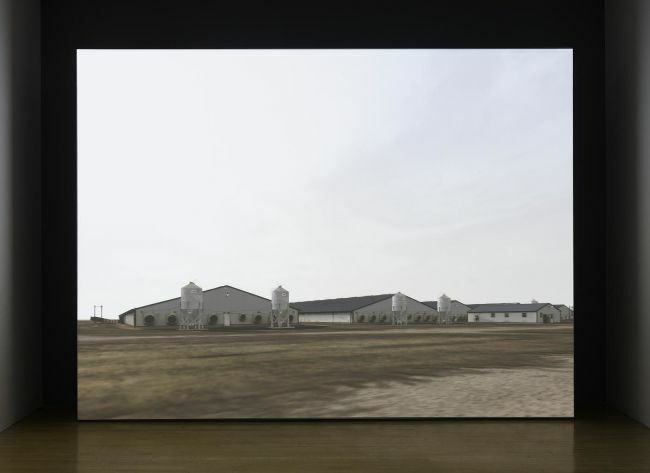 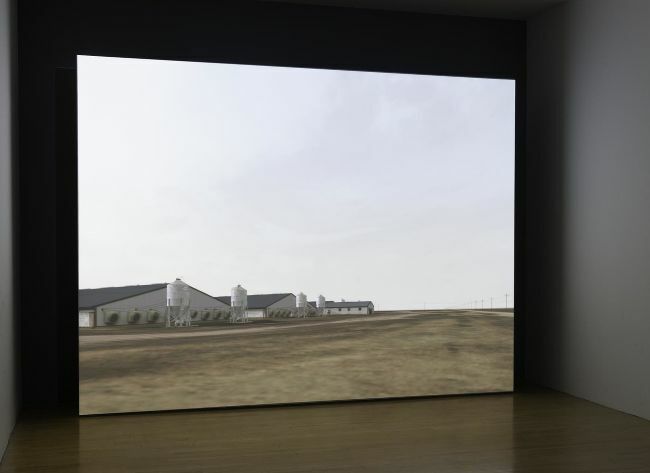 Extending from Animated Scene, his critically acclaimed presentation at the 53rd Venice Biennale, the artist will exhibit two new works, Sow Farm (near Libbey, Oklahoma) 2009, which depicts a sprawling, unmanned, computer-controlled agricultural complex on the American Great Plains, and Lufkin (near Hugo, Colorado) 2009, a portrait of an oil derrick in the same region. 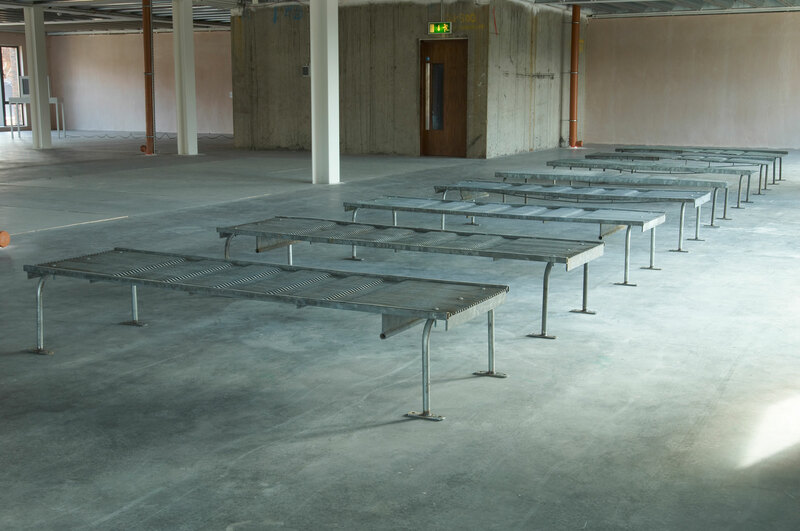 Mild steel benches, echoing the sheds represented in the Grow Finish Unit and Sow Farm works are installed on the third-floor space of a redundant office block. 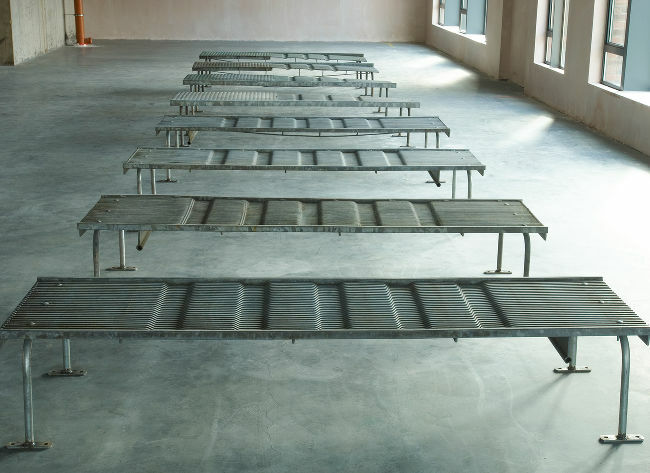 The objects use the slatted floors typically used in sow farrowing environments as the surface of the bench. 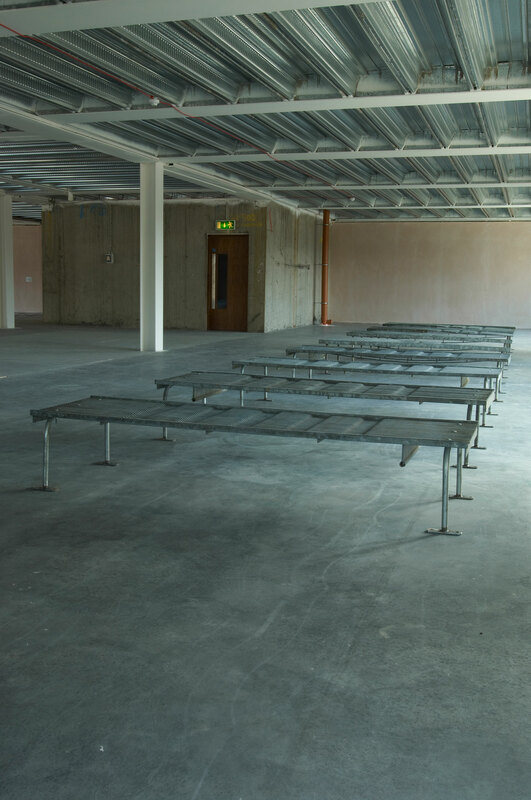 The polished floor of the exhibition space is treated as a plain or expanse on which the benches rest. 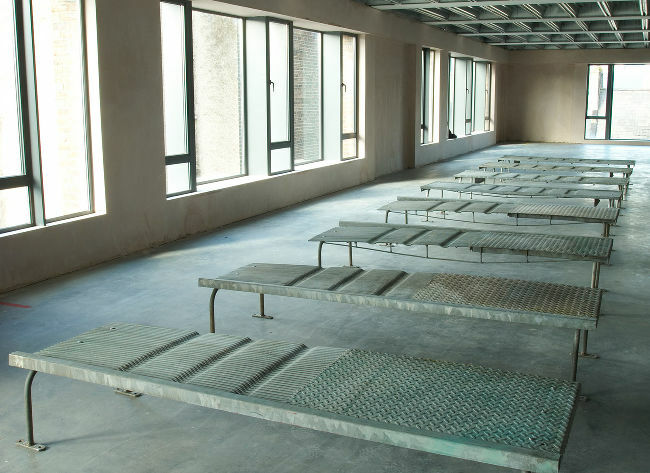 From the windows, views are offered to an area of Limerick formerly known as ‘Pigtown’, which once accommodated many slaughterhouses and pig-processing factories. 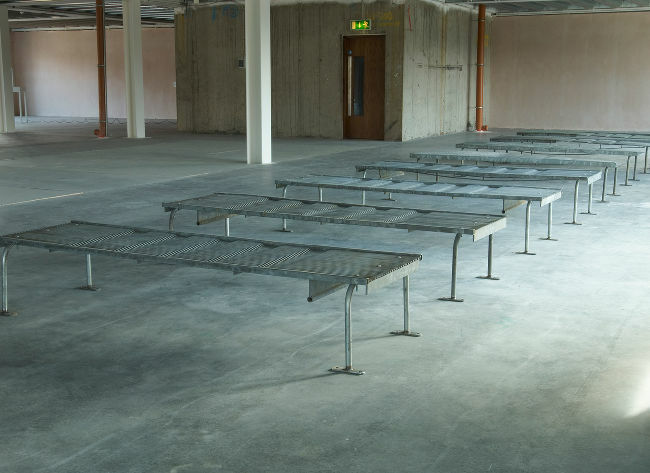 The benches are made from two types of ready-made drained slatted floor sections used in pig-production farms – one with an undulating anti-slip surface for the sow, and the other with a heated floor-pan insert to provide comfort for piglets. 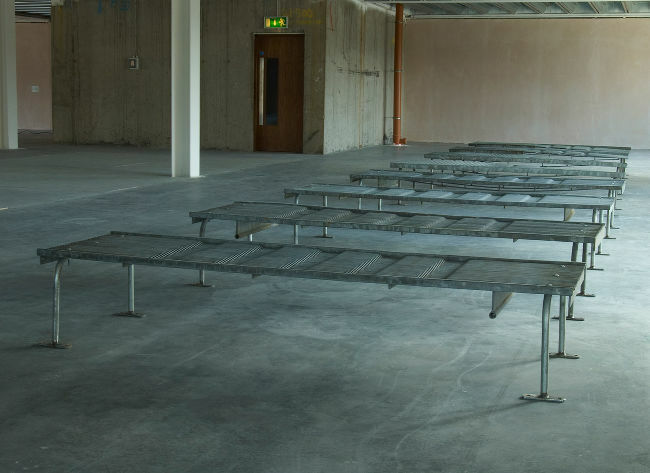 The public is invited to sit on these benches, and, in so doing, experiences a little of what it feels like to rest upon them. 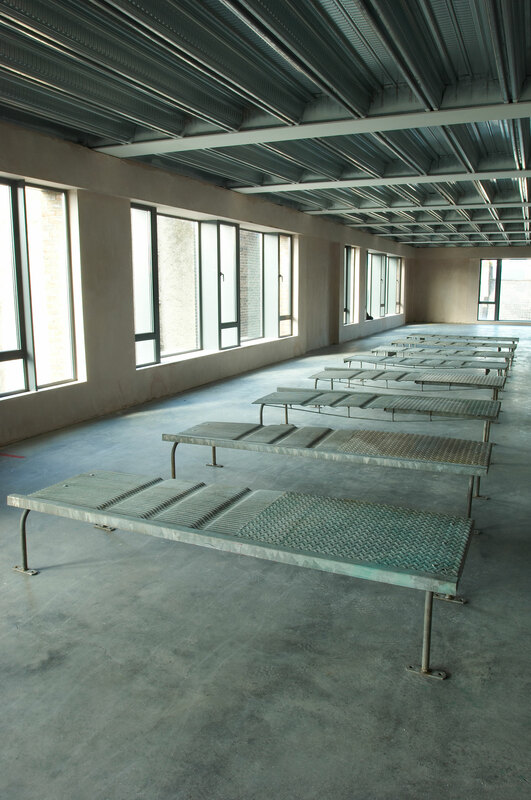 Rib-caged and carcass-like, much like the exposed profiled structural soffit of the space, each bench surface is raised from the ground to reveal an undercarriage of heating-pipe circuits and structural tension supports. 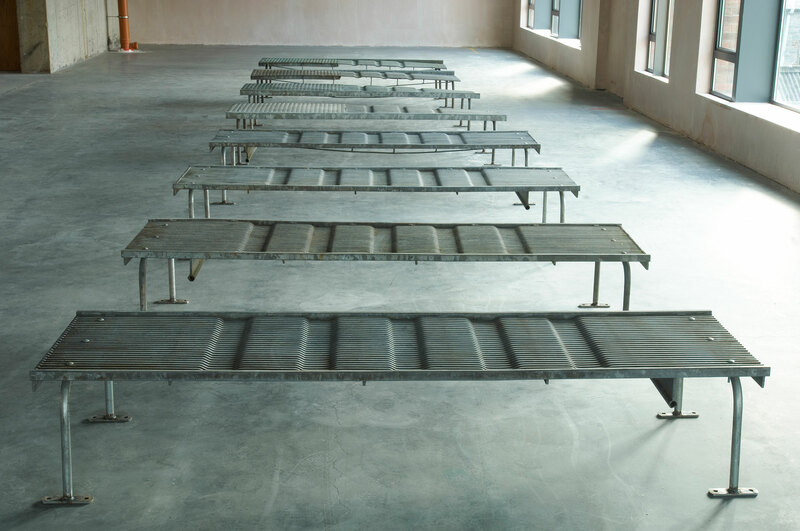 Handles made for farrowing cages have been adapted to provide support as bench legs. 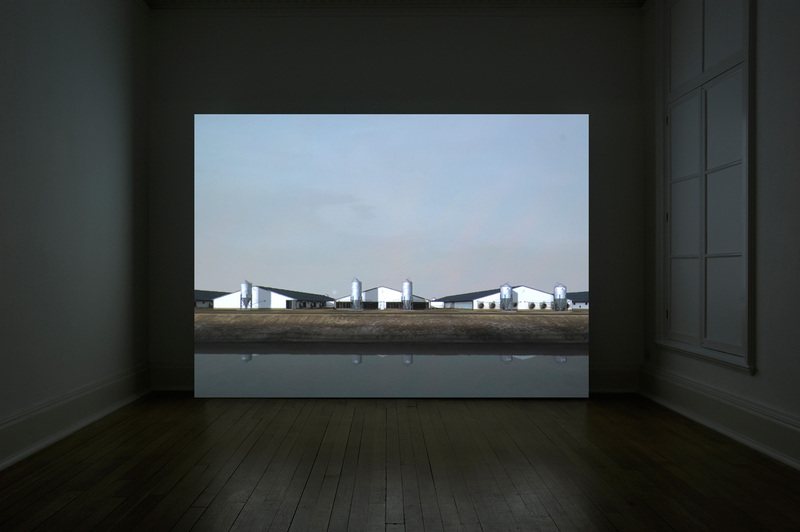 What you see is where you're at forms part of a complete re-hang of the Scottish National Gallery of Modern Art, launching a year of celebrations to mark the 50th anniversary of the Gallery. 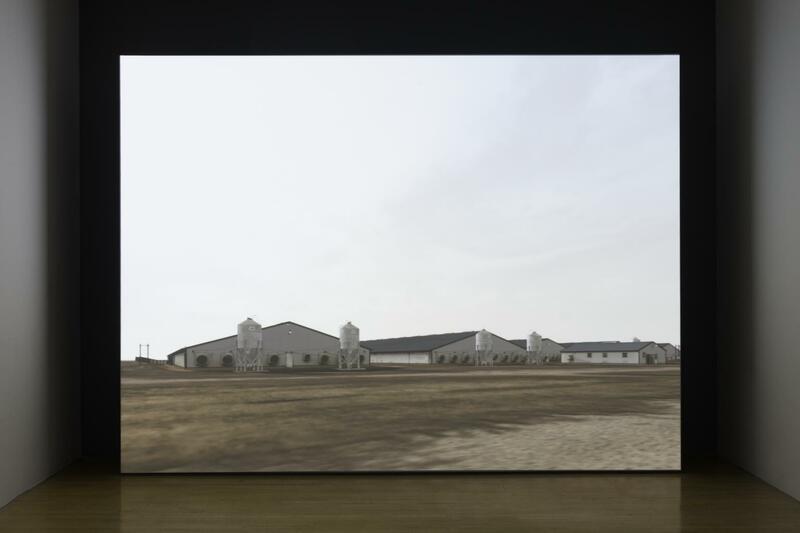 The display will reveal the richness and range of the Collection in a series of rooms which aim to delight and surprise. 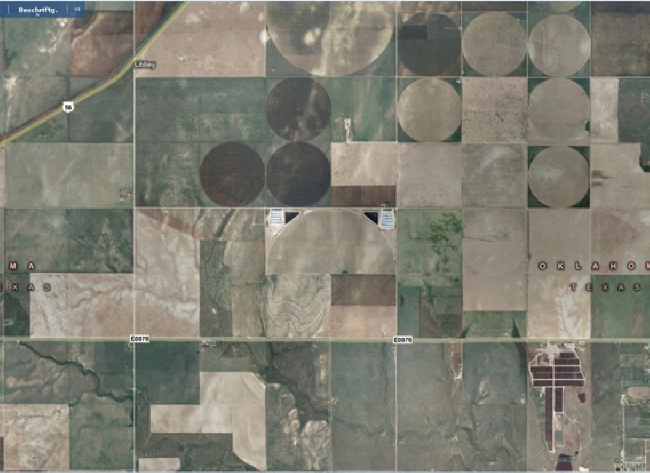 Satellite image of the border region of Oklahoma and Texas, USA. 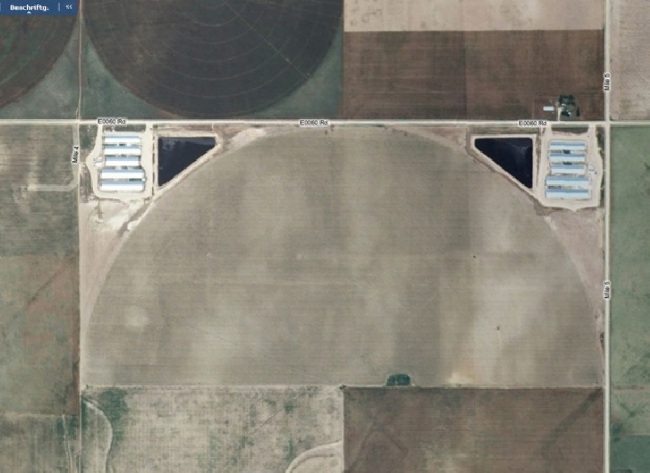 Satellite image depicting two sow farms similar to those featured in the work.